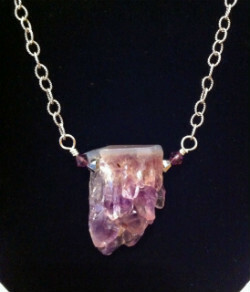 This lovely large chunk of amethyst is connected to oxidized textured sterling cable chain with Swarovski crystals and hand done wirework. This piece is 19″ long and has a sterling clasp. Designed and made by Beadology Iowa staff. Prerequisites: Kumihimo Basic Round Braid--see class on Friday, October 6. Learn how counted bead stringing can add pop to your Kongoh Gumi (round braid) beaded braids. 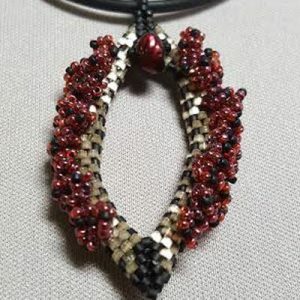 Include in this class will be tips on adding a pendant or large-holed bead during the braiding process as well as an adjustable sliding closure. Note: Take all three Kumihimo Immersion classes Oct 6-8 for $300–save $54. 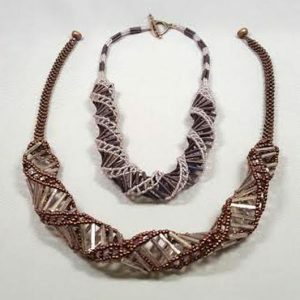 Learn to use Toho seed beads and Toho bugle beads to make this elegant helix necklace. 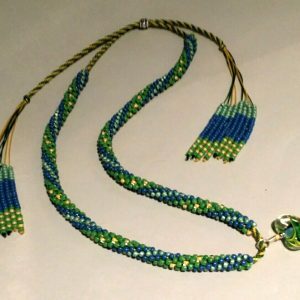 Based on knowledge of other beading stitches, participants will choose how to finish the necklace by stringing beads, using Ndebele (herringbone), or cubed right angle weave (CRAW).